Trans fats are now generally accepted to be toxic for human consumption. This is because in their attempt to behave like their bio-active cis counterparts, they fail miserably, poisoning essential metabolic processes, and leading to many deadly consequences. Includes: 1. Food Sources of Trans Fats; 2. Trans-Fat Free Foods; 3. What is a Trans Fat? 4. Brief History of Trans Fats; 5. When is a Fat Not a Fat? NOTE: This list was made before trans fats were banned from foods in 2018 (unless the level was less than 5% per serving, to protect foods that contain natural trans-fat foods). However, it is still a good idea to avoid foods in this list because they have other negative issues, such as GMO and/or too much sugar/starch. most deep fried foods such as french fries, onion rings, or fish and chips: ask the chef what kind of fat is used; good fats for deep frying include avocado oil and goose or duck fat. vegetable shortening (exceptions: coconut and palm oils, the naturally solid tropical vegetable oils free of trans fats unless specified as ‘hydrogenated’). Barbara’s Bakery (13) makes cereals and snacks. In addition, many natural foods are made with butter or coconut oil instead of poly-unsaturated vegetable shortening, and of course, you can make these foods yourself “from scratch” with natural ingredients. Before getting into that sticky wicket, I refer you to my articles: About Fats, an Introduction and Fats & FattyAcids. Glycerides:* Up to 3 fatty acids may be linked together via a glyceride backbone, forming a type of fat known as glycerides or acylglycerols (refer to About fats, an introduction for more). Glycolipids: A fatty acid connected to a sugar molecule. ‘*NOTE: Triglycerides are what is commonly called “fat,” as that is the form in which they are found in the stored fat of plants and animals. Mono- and di-glycerides are not normally present in stored fat, but may be present in lipoprotein particles and within cells. They are also used industrially in foods, as emulsifiers and shortening. provide insulation around nerve tissues (to promoting the conduction of the electric nerve impulses, and protect surrounding tissues from the electric impulses). A saturated fatty acid contains no double bonds in the hydrocarbon chain (and one double bond to one of the oxygens in the carboxylic acid group, COOH); instead the carbons in the chain have single bonds to the other carbons and to the hydrogens. This allows the carbons in the chain to spin/rotate. 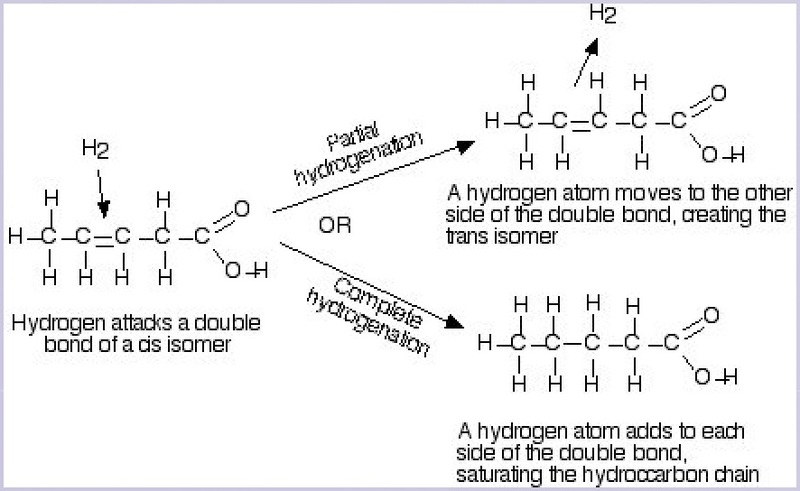 An unsaturated fatty acid contains at least one double bond in the hydrocarbon chain (plus the one to the carboxylic acid group). Those in the chain keep the carbons from spinning/rotating at the site of the double bond. In natural fatty acids, those double bonds are “cis” configuration which causes a kink in the chain at the site of the double bond, which allows them to be recognized by enzymes; that is, they are bio-active. “trans” (meaning opposite sides), which are not natural and not recognized by enzymes. By the 1920s, it was recognized that the hydrogenated fats were not the same as saturated fats, but were not aware of what was responsible for the difference. The libelous campaign against saturated animal fats started because consumers were not warming to the inexpensively produced hydrogenated fats, and the manufacturers needed to create a market. Still, food manufacturers (especially fast food chains) were not keen on these new fats until they realized the fats had a longer shelf life than natural fats like butter and lard. As early as 1956, there were suggestions in the scientific literature that partially-hydrogenated fats could be a cause of the large increase in coronary artery disease. Instead of alerting the general public, however, science and industry conspired to keep this knowledge a secret. Even though these chemically altered fats are not natural and have no known benefit to humans, they were pushed upon an unsuspecting public as healthful and modern, by industry and later by the FDA. But by the 1990s that it became obvious something was not good about the partially-hydrogenated fats. 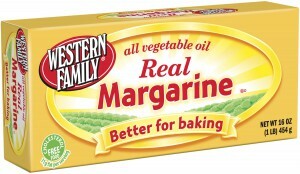 Serious health problems (diabetes, heart attack, stroke) were observed in individuals who consumed the altered fats, mostly in the form of margarine and Crisco. But nothing was done about it for more than a decade. Meanwhile, the medical industry continued to support the claim that saturated animal fats are bad for you, despite significant scientific evidence to the contrary. (See my article, Saturated Fats: A Bad Rap for more on this). Then, a few years ago, the problems with trans fats became general public knowledge, and Trans Fat content was added to food labels. When Is a Fat Not a Fat? Food manufacturers are very clever. They have figured out how they can continue to use their toxic chemically altered fats in foods and get away with it. You CANNOT TRUST FOOD LABELING. For more on this subject, refer to my article Chemically-Altered Fats.